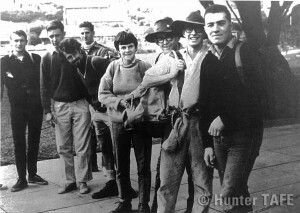 In 1966 the Newcastle Bushwalking Club had 50 members from the College and Newcastle University. They held many expeditions including visits to the Club’s Hut at Barrington Tops. Fortnightly meetings were well attended and the club supported the Search and Rescue Organisation of NSW, Federation of Bushwalking Clubs, and the Flora and Fauna Protection Society. If anyone has any interesting information about the Newcastle Bushwalking Club that they would like to share please post a comment or email us via the Hunter TAFE Historical Libguide. This entry was posted in Historical Collection - TAFENSW Hunter & Central Coast and tagged history, Hunter TAFE, Hunter TAFE Historical Collection. Bookmark the permalink.